The MINOX BN 7x50 represents the reference class for the basic models within the Nautik Line. Equipped with Porro prisms, these binoculars offer a very high light transmission combined with an extremely high plasticity for a spatial image. Position and distance to viewed objects can be precisely determined. On top of that, the compact and ergonomic construction offers a securehold, preferred by maritime and water sports enthusiasts. The MINOX BN 7x50 has a non-slip robust housing and is water tight down to a depth of 5 metres (16.4 feet). The nitrogen filling protects the inner optical elements from corrosion and fogging. Leading-edge technology, quality and functionality: a perfect symbiosis at a competitive value for money  First class optics: optical brilliance, high contrast and excellent colour rendition  High light transmission for a bright image even in twilight  High plasticity for a spatial image  Single ocular adjustment - full focus from 12 m (39.4 ft) to infinity  Fog free internal optics thanks to nitrogen gas filling  Non-slip and ergonomic housing, extremely robust. Binoculars - 7x50, Housing - robust themoplastic body, Surface - non-slip rubber armouring, Magnification - 7 x, Entrance pupil - 50 mm, Field of view - 124 m at 1000 m (7,1°), Exit pupil - 7.1 mm, Close-up range - 7 m, Eye relief - 24 mm, Twilight number - 18.7, Prism system - Porro, Coating - all optical elements are fully coated, Dioptre correction - from -4 to +6 dioptres, Eyecups - fold down rubber eyecups, Operating temperature - -20° to +50° C, Waterproof - Yes, down to 5 m, Weight approx. - approx. 980 g, Dimension (height x width x depth) - 223 x 78 x 163 mm, Design - Volkswagen Design. Comes complete with case, strap & cleaning cloth. NEW - The top class basic model with analogue compass. Even the basic model of MINOXs Nautic Line, the BN 7x50 C with an analogue compass, offers optical and mechanical precision at the highest level. Tough and reliable, it is equipped with a precisely functioning analogue compass and heading scale, guaranteeing an unerring navigation at sea and into every harbour. It combines comfortable handling and solid quality into a modern and robust housing. Demanding water sportspersons get excellently equipped top-of-the-line binoculars in the BN 7x50 C and that at unbeatable cost effectiveness. Leading-edge technology, quality and functionality: a perfect symbiosis at a competitive value for money  First class quality optics: optical brilliance, high contrasts and true colour rendition  Waterproof, non-slip, robust housing  Precise navigation using the analogue compass display and analogue heading scale  Turnable eyecups: fast and efficient  Waterproof and non-fogging thanks to nitrogen filling  Single ocular setting  fully sharp image from 20 metres to infinity. Binoculars - 7x50, Compass - analogue, Additional features - analogue compass and heading scale, Housing - tough synthetic housing, Surface - non-slip rubber armouring, Magnification - 7 x, Entrance pupil - 50 mm, Field of view - 123 m at 1000 m (7,1°), Exit pupil - 5.3 mm, Close-up range - 7 m, Eye relief - 18 mm, Twilight number - 18.7, Prism system - Porro, Coating - all optical elements are fully coated, Dioptre correction - from -4 to +6 dioptres, Eyecups - fold down rubber eyecups, Operating temperature - -20° to +50° C, Waterproof - Yes, down to 5 m, Weight approx. - approx. 1010 g, Dimension (height x width x depth) - 223 x 78 x 163 mm, Design - Volkswagen Design. With the innovative BN 7x50 DC, MINOX has created a new generation of water sports binoculars allowing for trend-setting advantages as opposed to the presently available navigational binoculars containing conventional compass technologies.  A fully integrated digital compass in the centre of the field of view  Progress with convincing advantages. Full concentration on the moment. All information is visible at the touch of a button  in the fraction of a second. With the digital compass display in the centre of the field of view, you will never lose sight of the most important details. Thanks to its new technology, the BN 7x50 DC is fitted with a digital compass integrated right into the body of the binoculars. 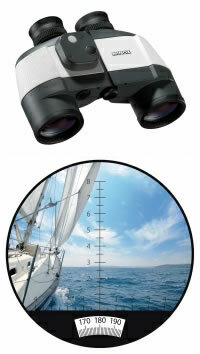 The analogue compasses fitted into conventional water sports binoculars typically protrude out of the body and greatly impair the handling of the binoculars. An advantage making the BN 7x50 DC a uniquely comfortable companion where ergonomics and functionality are concerned. At the simple push of a button, 360° all round information  all important information for the skipper are located right in the middle of the field of view: whether a digital compass display with automatic tilt compensation, air pressure reading, tilt function to assess the height of objects, or a digital stop watch  with the BN 7x50 DC you will never lose sight of essential data. Calculated and constructed at the highest of precision, MINOX optics from the Nautik Line offer maximum brilliance and clarity, brightness, contrast and resolution right down to the last detail as well as natural colour rendition. 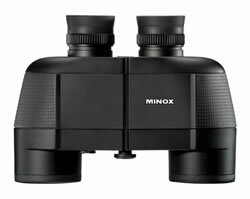 The MINOX Nautik Line binoculars are filled with nitrogen gas making them water tight down to 5 metres, floatable and anti-fogging. The MINOX Nautik Line binoculars are all covered in a particularly robust non-slip rubber armouring, ideal for rough use on water. With or without eyeglasses or sunglasses  the quickly adjustable eyecups of MINOXs Nautik Line are comfortable for all users. 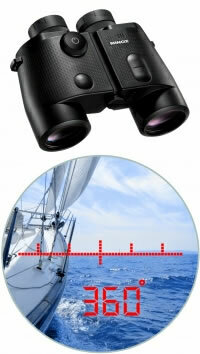 With the single ocular setting, MINOX Nautik Line binoculars remain sharp from 20 meters to infinity. 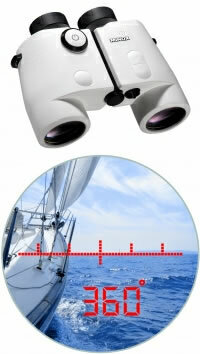 Included in the delivery to keep your binoculars constantly close at hand. The BN 7x50 DC offers the revolutionary advantage of having the digital compass display right in the middle of the field of view  observed objects and compass display remain in the centre of attention at all times. The BN 7x50 DC is equipped with a highly sensitive gravity sensor allowing for automatic tilt compensation. The compass functions at the highest level of precision. Whether the compass display is at Centre Mark in the middle of the field of view or displayed as a digital graticule  it is entirely up to you, according to your preferences. Binoculars - 7x50, Compass - digital, fully integrated, Additional features - Digital compass display in the centre of the field of view, digital graticule, tilt function - robust thermoplastic body - non-slip rubber armouring, Magnification - 7 x, Entrance pupil - 50 mm, Field of view - 126 m at 1000 m (7,1°), Exit pupil - 7.1 mm, Close-up range - 7 m, Eye relief - 22 mm, Twilight number - 18.7, Prism system - Porro, Coating - all optical elements are fully coated, Dioptre correction - from -4 to +6 dioptres, Eyecups - fold down rubber eyecups, Operating temperature - -20° to +50° C, Waterproof - Yes, down to 5 m, Weight approx. - approx. 1250 g, Dimension (height x width x depth) - 195 x 72 x 160 mm, Design - Volkswagen Design. With the innovative BN 7x50 DCM, MINOX has created a new generation of water sports binoculars allowing for trend-setting advantages as opposed to the presently available navigational binoculars containing conventional compass technologies. A fully integrated digital compass in the centre of the field of view. Thanks to its digital technology, the revolutionary BN 7x50 DCM offers a wide range of innovations. Thanks to its new technology, the BN 7x50 DCM is fitted with a digital compass integrated right into the body of the binoculars. 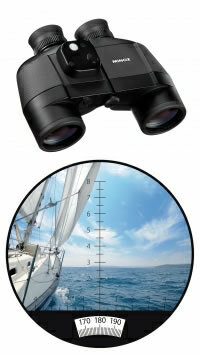 The analogue compasses fitted into conventional water sports binoculars typically protrude out of the body and greatly impair the handling of the binoculars. An advantage making the BN 7x50 DCM a uniquely comfortable companion where ergonomics and functionality are concerned. At the simple push of a button and at 360°, all important information for the skipper are located right in the middle of the field of view: whether a digital compass display with automatic tilt compensation, air pressure reading, tilt function to assess the height of objects, or a digital stop watch  with the BN 7x50 DCM you will never lose sight of essential data. The BN 7x50 DCM offers the revolutionary advantage of having the digital compass display right in the middle of the field of view  observed objects and compass display remain in the centre of attention at all times. The BN 7x50 DCM is equipped with a highly sensitive gravity sensor allowing for automatic tilt compensation  the compass functions at the highest level of precision. Aside from the previously mentioned features, the BN 7x50 DCM offers additional practical advantages. For example the digital tilt function which allows the height of the observed object to be determined based on the inclination angle reading in the display. Additionally, the BN 7x50 DCM is equipped with an altimeter and a thermometer. A further highlight of the BN 7x50 DCM includes a digital barometer function. This includes the reading of the current air pressure as well as the air pressure over the previous 8 hours. Weather changes can thus be detected and predetermined in good time and for your own safety. Equipped with a digital stopwatch with split time, the MINOX BN 7x50 DCM leaves nothing more to be desired. Binoculars - 7x50, Compass - digital, fully integrated, Additional features - digital compass display in the centre of the field of view, digital graticule, tilt function, barometer, air pressure and air pressure history, time, stopwatch, altimeter, temperature and temperature history - robust thermoplastic body - non-slip rubber armouring, Magnification - 7 x, Entrance pupil - 50 mm, Field of view - 126 m at 1000 m (7,1°), Exit pupil - 7.1 mm, Close-up range - 7 m, Eye relief - 22 mm, Twilight number - 18.7, Prism system - Porro, Coating - all optical elements are fully coated, Dioptre correction - from -4 to +6 dioptres, Eyecups - fold down rubber eyecups, Operating temperature - -20° to +50° C, Waterproof - Yes, down to 5 m, Weight approx. - approx. 1250 g, Dimension (height x width x depth) - 195 x 72 x 160 mm, Design - Volkswagen Design. 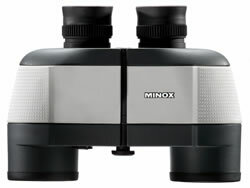 All Minox Nautik range binoculars are fully waterproof up to 5m. That said if you drom them in the 'Drink' they will sink like a stone unless you have them attached to one of these handy floatation straps. Protect your investment... A must!